Where did the concept of heaven or paradise come from? 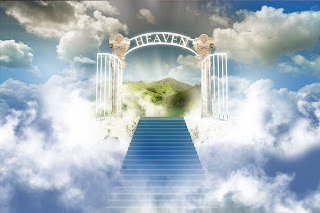 One of the major promises of virtually all religions is that after you die here on earth, you will be taken to a paradise in heaven where everything will be perfect forever. Of course, you have to do everything the religion requires you to do to qualify. In some cases that is separating your dishes that have had meat in them versus dairy, suffering through genital mutilation, tithing 10% of your income, etc. The concept of heaven or paradise is and has been a strong motivator for religions to keep people from leaving the flock. But where did this concept arise in the Abrahamic tradition? Was it there from the beginning or did it get added later? Most people who were raised religiously might start their explanation with the story of the Garden of Eden. They would say that until Eve took a bite of that pesky apple, everything was hunky dory. So let’s start there. The story of the Garden of Eden in the Bible has been interpreted in many ways. In the text itself, Eve is tempted by a snake. This snake is not yet Satan, the devil, or an evil force. It is simply a snake. One can assume from this passage that the snake at one time had arms and legs and could talk. Another interpretation from this story is that the Garden of Eden was paradise where you didn’t have to work, wear clothes, or do much of anything. Obviously that all changed with the punishments meted out by god to Adam (till the ground, work hard) and Eve (pain in childbirth, obey your husband) after that fateful day. The sources behind this story come from many different areas. The symbol of the goddess in many cultures was a snake because of its regenerative powers. Asherah, a Canaanite goddess was also associated with worship in nature. Juris Zarins, an anthropology professor, posits that an area in modern day Iraq served as the basis for the story of the Garden of Eden. There are four rivers mentioned in the story and he believes that they can be traced to the confluence of the Tigris and Euphrates in Iraq. An ancient civilization, the Sumerians, existed just north of the Persian gulf from approximately 2800 to 1600 BCE, long before the Hebrew tribes came into Canaan. Interestingly, in the Sumerian myth, the Epic of Gilgamesh, Enkidu falls from immortality to mortality after a “hapless sinful union with a fallen woman.” Sound familiar? Zarins also believes that the flooding and receding of the waters of the Persian Gulf made the area alternately wet or dry. Beginning in 6000 BCE the area was once fertile again. He has an interesting hypothesis that there may have been a clash as hunter-gatherers returned to this area only to be met by the newly minted agriculturalists. In addition to the geological work that supports his thesis, the word Eden existed in Sumerian, the first written language and meant fertile plain with the word Adam meaning something like “settlement on the plain.” The word paradise comes from the Old Iranian word for exceptional gardens, pairi-daeza, which in later years was shortened to parideiza and then to paridiz. But this paradise was still on earth, not yet in heaven. That concept came in much later to the Hebrew mythology and is strongly influenced by the Persians. Long after the fall of the Northern Kingdom, the Southern Kingdom, Judah, was conquered by the Babylonians in 598 BCE. The scribes, priests, and elites were carted off to Babylon where they could be watched over. In 539 BCE, one of the kings of Persia, Cyrus the Great or Darius, allowed them to return and rebuild the temple when Persia conquered Babylonia. Whew! There was a lot of conquering going on then. The Persians, through their beliefs known as Zoroastrianism, were one of the first civilizations to develop the dual concept of good and evil. Zoroaster in Greek or Zarathustra in Persian was the priest. At the age of thirty, he had a revelation that led to his belief in the “one true god.” He had formerly been a polytheist. Prior to this influence, the Hebrews attributed the powers of good and evil to their one god, Yahweh. This passage may have even be an attempt to counter the Persian duality and affirm that there was just one god. While the Persians had one god, they also had a counterforce for evil. The good was known as Ahura Mazda and the evil force Angra Mainyu. Eventually this concept of duality crept into the writings of the Hebrews and the beginnings of the notions of heaven and hell came into being for them. But this paradise was still on earth, not yet in heaven. That concept came in much later to the Hebrew mythology and is strongly influenced by the Persians.Even then, the Hebrews didn’t have a strong notion of heaven as a place where you went when you died. The book of Daniel is attributed to a fairly late period in the creation of the Old Testament, around 200 BCE. Daniel replaced the old notion of Shoel where everyone went when they died no matter what they did on earth to an idea approaching the current notion of heaven and hell. But it is Christianity that developed the strongest notion of heaven and hell. It is the New Testament that takes the snake from the Genesis story and creates the evil force known as the devil. Elaine Pagels, in her book, The Origin of Satan, gives her explanation of the elevation of this force of evil called the devil. Mark, who deviated from mainstream Jewish tradition, starts his gospel (likely the first gospel written) with Jesus being tempted by the devil. The book of Revelations has the most interesting depiction of the devil whose portrayal later incorporates the cloven hooves of the Greek god Pan and the talon feet of the dragon. And what better way to explain the disasters, disease, wars, hunger, etc. that has befallen man since the beginning of time? It has always intrigued me that an omniscient and all powerful god could not get rid of a pesky devil. How about making our lives better on this earth? What if all the riches of the Catholic Church were liquidated and the money was used to build permanent housing for people around the world? What if people who tithe 10% to the church would devote this money to helping out those less fortunate than them? Wouldn’t we start the path to creating a paradise here on earth? Where everyone had enough food, shelter, and medical care to live a long and fruitful life? Where everyone could be fully employed? Yes, it sounds like pie in the sky, but look at where we spend our money now – 54% of discretionary spending in the United States is spent on the military. And what has been the major theme for our wars over the last 2000 years? Religion would undoubtedly win. It is time to face the reality that this is our life, this one, right here on earth and we’d better do something now to make it better. Rodney Stark, Discovering God (New York, NY: Harper One, 2007), 162. Elaine Pagels, The Origin of Satan (New York, NY: Vintage Books, 1995), 12.